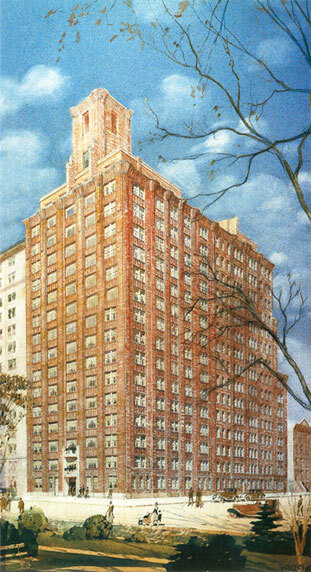 336 Central Park West, designed by the architectural firm of Schwartz and Gross, in 1929. Although not a household name, Schwartz and Gross was one of the most prolific residential architectural firms in Manhattan in the earlier part of the 20th century, responsible for major apartment buildings on virtually every main residential thoroughfare in Manhattan. The firm’s practice spanned three-and-a-half decades, from the flamboyant pre-World War I styles, to the more sedate Neo-Georgian style of the 1920’s and then the Art Deco architecture that followed. Examples of their work include 271 Central Park West (1913) at 87th Street and 241 Central Park West (1930) at 66th Street, but a more inventive Art Deco building.­ The bricks gradually change from deep purple at the base to to golden beige at the tower. Constructed just before changes in the building code allowed for setbacks, 336 Central Park West takes its inspiration from the Art Deco movement and features a unique Egyptian-inspired cornice and patterned brick-work.